MOSCOW, March 4 (RIA Novosti) – Russian President Vladimir Putin said Tuesday that his country has not deployed any troops in Crimea recently and has no plans to annex the peninsula. 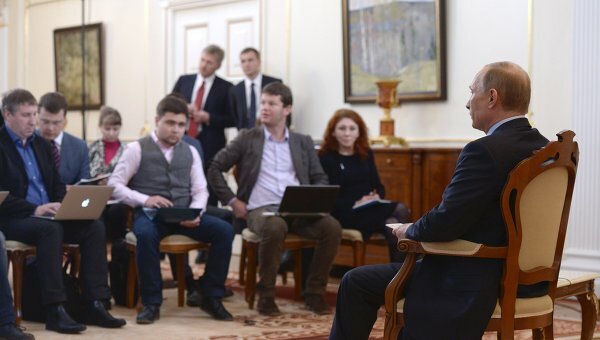 President Vladimir Putin (right) facing journalists at the Novo-Ogaryovo residence to answer questions concerning the situation in Ukraine, March 4, 2014. Putin said, however, that up to 22,000 Ukrainian army troops with heavy military equipment are now under the control of local militias. Ukrainian authorities earlier denied any mass desertions in Crimea-based army units. Russia’s Black Sea Fleet is based in Crimea, with a bilateral deal authorizing deployment of up to 25,000 Russian troops at the fleet’s bases. Russia has denied that the fleet’s troops are involved in the standoff. Official Moscow said earlier that it was ready to launch an invasion in Crimea and other predominantly Russian-speaking regions in eastern Ukraine to protect locals from the threat of nationalist violence in the wake of last month’s revolution in Kiev, which was spearheaded by Ukrainian nationalist groups. Speaking about a possible annexation of Crimea, Putin said it is up to the local population to decide. “I believe only residents of a territory can and should decide their own future, provided they have safety and freedom of vote,” Putin said. Crimean authorities have announced plans to hold a referendum on the peninsula’s status later this month. The majority of the local residents are Russian speakers who support close ties to Moscow, though not necessarily secession from Ukraine.